A charming blog that gives you an intimate look into her home and everything that she loves. The photos are interesting, well thought out and refreshingly taken mostly by her! So many trinkets and lovely little bits. Rose Petals and Rust is currently having a fun giveaway with a treasure chest full of goodies for the prize. By just leaving a comment on her post enters you to win! 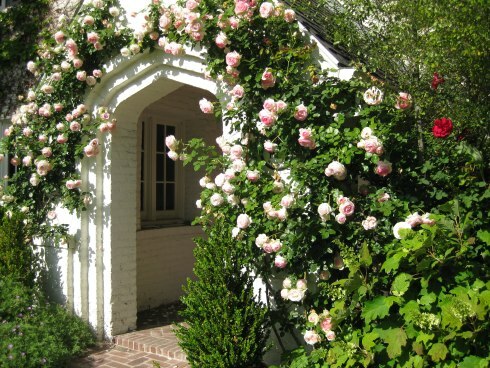 Isn’t this flower cover doorway to die for? All I want to do is stand, enjoy the warm sun and smell all the wonderful blooms. Sneak Peek of the prize you could win! Check it out. CLICK HERE!